Two paths coming from different directions, backgrounds and families bring this couple together. Two rivers merge into one to flow under the bridge. In marriage there will be times of turbulence and times of tranquility just as in a river there may be rapids and gentle streams. 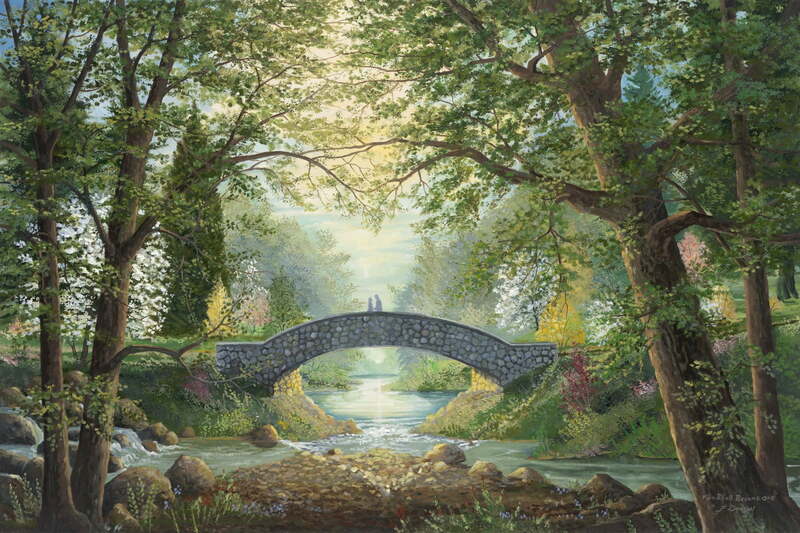 A beautiful heart is formed by two trees joining above and gently encircling the couple, connecting under the bridge to become complete. These two trees represent the wondrous experience of growing in oneness together. It would be a miracle for two trees to actually grow into one. It is no less a powerful work of God to enable two persons to become one flesh. The cross reflected in the water reminds us to cross our hearts and hope to die: Cross our hearts with the cross of Christ and hope to die to our selfish ways. That is how two shall become one.